The Columbian at RockPlaza Lofts welcomes you home to brand new studio, 1 bedroom and 2 bedroom loft apartments. The units feature stainless steel appliances, in-unit washer/dryer, a lavish rooftop deck, hardwood floors, 24-hour in-unit key access and windowed elevator lobbies overlooking Newark’s Central Business District. At The Columbian, you’ll enjoy access to The New Jersey Performing Arts Center, The Newark Museum, The Prudential Arena, Newark Bears Stadium and the renowned Portuguese food in The Ironbound, just blocks away. The Columbian is within steps of Newark’s five universities and the corporate headquarters of Prudential, PSE&G, Verizon and Panasonic. Enjoy a Rita’s Gelati at Rita’s Italian Ice, pick up a sandwich for lunch at Subway, or indulge in a famous bar-b-que pit plate at Dinosaur Bar-B-Que – all without leaving the neighborhood! Experience a prime address that is just two blocks from Newark Penn Station, 12 minutes from Manhattan, and near Newark Liberty International Airport making this an exceptional living choice for commuters seeking modern conveniences with an exciting atmosphere. The Columbian Block at Rock Plaza Lofts is located in The Four Corners Historic District. It was originally built in an era of prosperity influencing merchants to lighten, upgrade and modernize. Hanini and Fidelco Realty Group’s redevelopment of The Columbian Block was done with a nostalgia for the bustle of Broad and Market area, once the busiest intersection in the United States, and the heart of commerce. The Columbian Block remains one of the widest and most architecturally imposing buildings on Market Street. 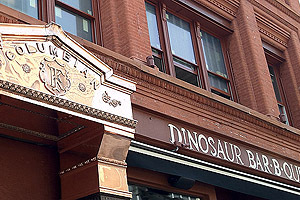 The original western half of the building was a family owned restaurant, constructed in 1890. The eastern addition housed a store, originally constructed in 1909. The Columbian Block is unique in its use of elaborate molded brick to create surface texture and rhythm, its dark color and in its scale and massing when compared with surrounding buildings in the Four Corners Historic District.